GATA is excited to present "Introduction to SoulCollage®" with Edna Bacon, ATR-BC and SoulCollage® Facilitator on Saturday, January 11, 2014, 12-5pm*. SoulCollage® is a process using images (from magazines, books, newspapers, mailings) to create a personal set of cards that clients, with the therapist, can then use to access their inner knowledge for healing and guidance. For people in the helping professions, it is a process that can be used in Self-Care. 1) Participants will be able to describe the theory and the process of SoulCollage®. 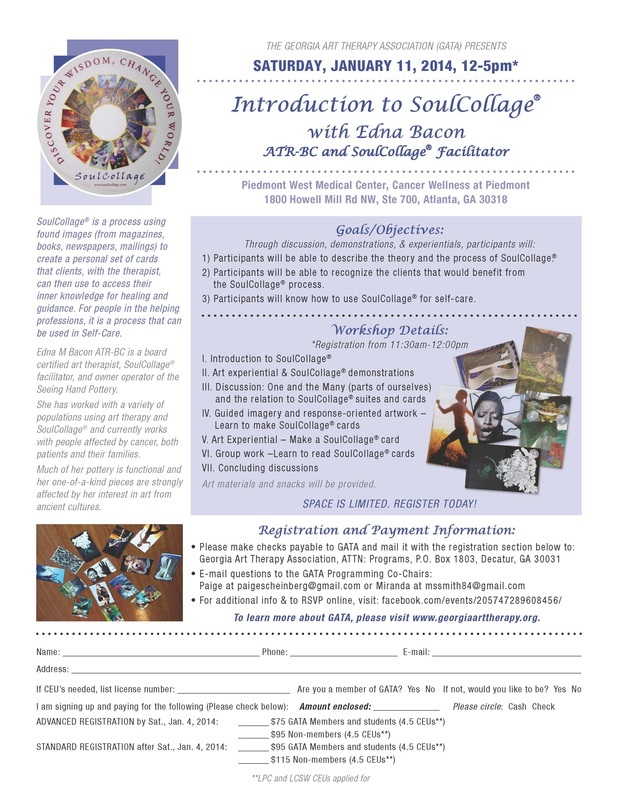 3) Participants will know how to use SoulCollage® for self-care. ~ Art materials and snacks will be provided. ALL ARE WELCOME! SPACE IS LIMITED. REGISTER TODAY! Edna M Bacon ATR-BC is a board certified art therapist, SoulCollage® facilitator, and owner operator of the Seeing Hand Pottery. She has worked with a variety of populations using art therapy and SoulCollage® and currently works with people affected by cancer, both patients and their families. Much of her pottery is functional and her one-of-a-kind pieces are strongly affected by her interest in art from ancient cultures.